Greece's economy grew modestly but weak demand and scant investment mean a strong rebound after years of recession remains elusive a year after the country nearly crashed out of the euro. Recent data showed the 176 billion euro ($196.8 billion) economy expanded by 0.2 percent in April to June, slightly less than a previous estimate of 0.3 percent due to weaker consumer spending and net exports. It was the first quarter-on-quarter expansion since late 2015 and followed a 0.2 percent contraction in Q1. Facing a second bailout review entailing an unpopular loosening of labor laws in the autumn, Athens is keen to show a fatigued electorate that painful taxation and pension cuts that came with last year's 86 billion euro bailout deal will bear fruit and lead to economic recovery. But kickstarting growth to bring down an unemployment rate of nearly 24 percent, the highest in the euro zone, is a challenge as a fiscal straightjacket to attain budget surpluses of 3.5 percent of economic output weighs on economic activity. Jaded by years of austerity, Greeks were unimpressed by the recent economic figures. "The GDP turnaround in the second quarter doesn't mean a thing for us in retail trade, there is no liquidity in the market," said Antonis Papadakis, 60, a clothing wholesaler who has seen his sales fall 70 percent during the debt crisis years. 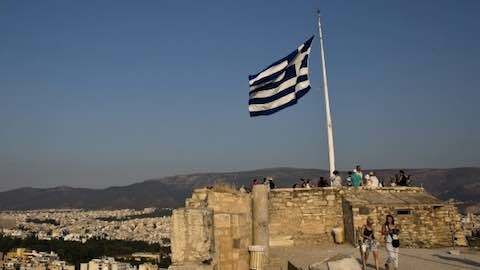 The data showed Greece's economy shrank 0.9 percent on an annual basis in the second quarter, more than a flash estimate of -0.7 percent, with economists expecting a mild recession for the year as a whole. "We had a downward revision but it is encouraging that GDP recorded positive growth on a quarterly basis," said Eurobank economist Platon Monokroussos. "Overall, a milder than initially expected contraction in the first half points to a full year GDP decline of close to 0.5 percent or slightly better." The European Commission and Greece's central bank project a 0.3 percent economic contraction this year while the OECD sees a milder 0.2 percent decline. Rating agencies Moody's and S&P are more pessimistic, expecting the economy to shrink 0.7 percent and 1.0 percent respectively. The EU sees the economy rebounding by 2.7 percent in 2017. Looking at the components of gross domestic product, the year-on-year decline in economic output was due to a further weakening of private consumption and a slightly negative contribution from net exports. Consumption declined 0.2 percent in the second quarter from Q1 and by 1.9 percent year-on-year. Imports fell 0.4 percent and exports decreased by 1.0 percent, while gross capital formation increased 1.0 percent from the previous quarter. "Despite the revision, the figures are in line with expectations for a recovery in the second half of the year, unless there is a further slump in private consumption," said National Bank economist Nikos Magginas. For others, the small pickup in growth may be too little, too late. "What rebound? I'm ready to kill myself," said Tassos Sidiropoulos, a street vendor selling dry nuts in central Athens. Europe: "Greek Economy Grows Modestly"